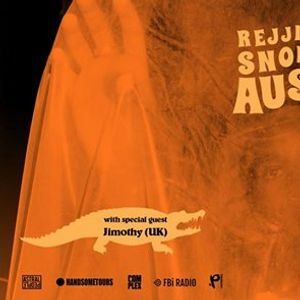 Rejjie Snow will be joined at all shows by north London rapper and musician Jimothy (fka Jimothy Lacoste) for his debut AU performance. Rejjie is a scene unto himself. He lives wherever his suitcase settles, wherever the songs send him — Los Angeles, New York, London — tangling words into beautifully complex knots that blur biography with fantasy over a shifting mass of rainy loops, technicolor keys, and trippy percussion. And then there’s his voice, deep and otherworldly, capable of riding a beat with metronomic precision, cooing to raw piano, or yawping Prince-like over a soul-rock-jazz groove. 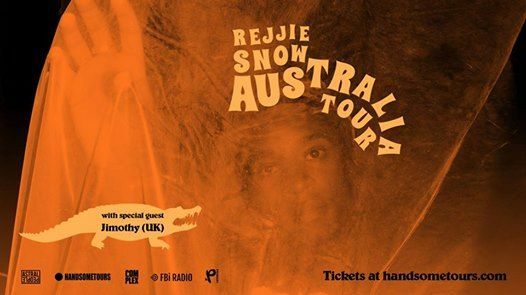 Following on from success of Rejjie’s debut album Dear Annie, executive produced by Rahki (Kendrick Lamar, Ab-Soul, Eminem) and featuring collaborations with Aminé, Kaytranada, Anna of the North, Cam O’bi (Chance The Rapper, SZA, Vic Mensa) and off the back of a sold out June 2018 Aussie & NZ tour, Rejjie is set to return his live show to eager fans with a new show to boot. As a perfect complement to Rejjie’s bold and idiosyncratic manner, Jimothy’s personality and left-of-centre outlook has tinges of Mike Skinner and draws accidental parallels to fellow north London dance-grime-electro collective Man Like Me, but his musical lineage seems more informed by an internal struggle with adolescent boredom and filling a void for the shy and insecure. In a world of constant bombardment of ‘new, hot’ 18-year-olds, Jimothy’s approach is more mature and considered, shying away from ‘living for the likes’. His lyrics and music have a more Tony Robbins feel while being framed in the backdrop of grime 2.0 and the new industry of UK road rap. Jimothy has had co-signs from the likes of Hypebeast (10 UK Rappers to Watch), Dazed (Top 20 Tracks of 2017) and Giggs. 2018 saw Jimothy release an impressive string of singles, including ‘I Can Speak Spanish’, ‘Subway System’ and his latest ‘Getting Carjacked’. With both artists introspective and unapologetically real this show promises to take audiences on a personal yet fun and irreverent journey.